Setting aside political differences, India’s two leading parties --the Congress and BJP -- reacted sharply to Pakistan Army Chief General Raheel Sharif’s statement on Kashmir. Terming the Kashmir Valley an “inalienable” and “integral” part of India, leaders on both the sides junked the Pakistan Army Chief’s claim that Kashmir was Islamabad’s “jugular vein”. Finance Minister P Chidambaram said no one in the world had any doubt that “Kashmir was and will be India’s integral part”. Reminding Pakistan of people’s participation in the Lok Sabha elections in Jammu and Kashmir, he called it a testimony to the fact that the state belonged to India. His thoughts were echoed by I&B Minister Manish Tewari. “In fact, the real issue is that Pakistan is in illegal occupation of large parts of Jammu and Kashmir,” Tewari said. A day after it slammed Interior Minister Chaudhry Nisar Ali Khan for his comments against Narendra Modi over the Dawood Ibrahim issue, the lead Opposition party vociferously condemned Sharif’s “provocative and aggressive comments”. BJP spokesperson Nirmala Sitharaman said Jammu and Kashmir is an integral part of India and “a unanimous resolution of the Indian Parliament has stated in no uncertain words that the entire Jammu and Kashmir, inclusive of those parts which are under illegal occupation by Pakistan, belong to India. The elected civilian government of Pakistan should ensure that it focuses its attention on building a peaceful Pakistan and not allow its army to pose a threat and issue alarm calls against peace in the region”. “India knows how to handle its own strategic imperatives and requirements,” senior BJP leader Ravi Shankar Prasad added. India and China have decided to conduct a joint military exercise at Bathinda, less than 100 kms from Pakistan. The exercise, planned for the second half of the year, will be the first-ever foray of the People’s Liberation Army (PLA) of China close to India’s western borders. Since 2007, the two Armies have conducted three joint exercises — two in China and one at Belgaum in Karnataka. Now is the turn of India to host the PLA. The decision to conduct the exercise at Bathinda was finalised at a series of meetings held recently. 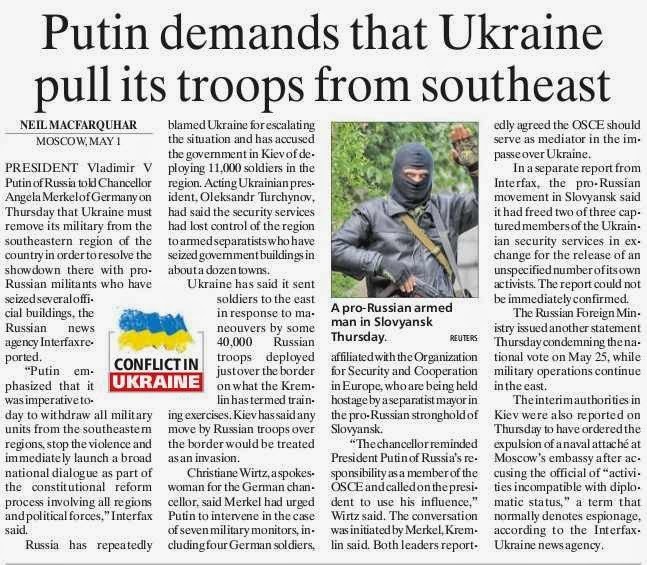 The dates and ambit of the exercise will be decided after coordination meetings between the two Armies, sources said. Bathinda is the base of the Indian Army’s 10 Corps and is dominated by mechanised and armoured regiments. A major IAF base, it houses leading fighters like Sukhoi 30MKI and the Mi-17V5 helicopters. The exercise assumes significance as it will be conducted less than 100 km east of Pakistan. The PLA often conducts joint exercises with Pakistan close to the India- Pakistan border, the last being held near Rawalpindi in Pakistan last month. Sources said India and China had so far focused on counter-terrorism steps. The choice at Bathinda signifies that some armoured component could be added. Both the countries are committed to expand the scope of military relations and widen the ambit of joint exercises under the Border Defence Cooperation Agreement (BDCA) signed in Beijing in October 2013. New Delhi and Beijing are worried at the outcome of the withdrawal of the US-led forces from Afghanistan in June 2014. Both countries have faced terrorism from Islamic radicals. China’s restive Xinjiang province located north of Jammu and Kashmir is a Muslim-dominated area. Both countries have been discussing Afghanistan and the scenario emerging in the wake of the withdrawal of US-led troops. India and China are rivals competing for global resources. They have an old border dispute pending since 1846 when the British first tried to draw boundaries. This often leads to tense situations along the un-demarcated Line of Actual Control running up to 3,488 kms. Indian leaders retorted strongly to Pakistan army chief's comment that the troubled state of 'Kashmir' was its 'Jugular vein'. 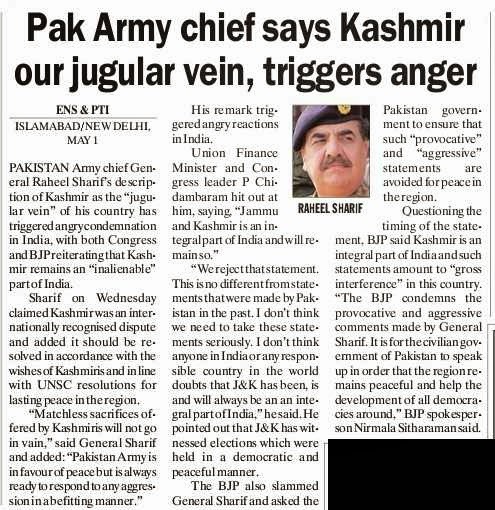 In a strong response, Lt. General PN Hoon said, "The statement is bizarre, Kashmir is the heart and a part of India." Former Army Chief and now BJP candidate from Ghaziabad, General VK Singh, is no stranger to controversies. 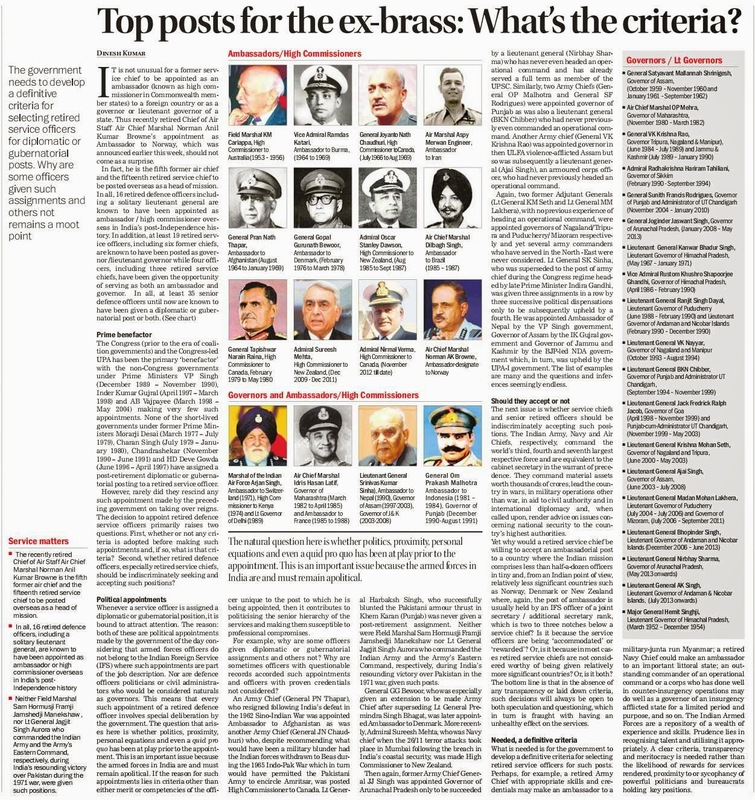 After wading through the long list of questions which were raised by both, the judiciary and media alike, Singh is back in the news, this time criticising the outgoing UPA government’s decision to appoint Admiral RK Dhowan as the new Navy Chief, and continuing the process of appointing Lt Gen Dalbir Singh Suhag as the new Chief of Army. In a recent article in The Sunday Guardian titled ‘VK Singh makes final bid to derail army succession’, journalist Vishal Thapar highlighted instances that showcase Singh as a person who managed to bring vengeful politics and communal opportunism within the top ranks of the Indian Army. Thapar portrays Singh as an uncharacteristic soldier, who looked to benefit familial ties within the army and went to what seem like great lengths to make his agendas successful. 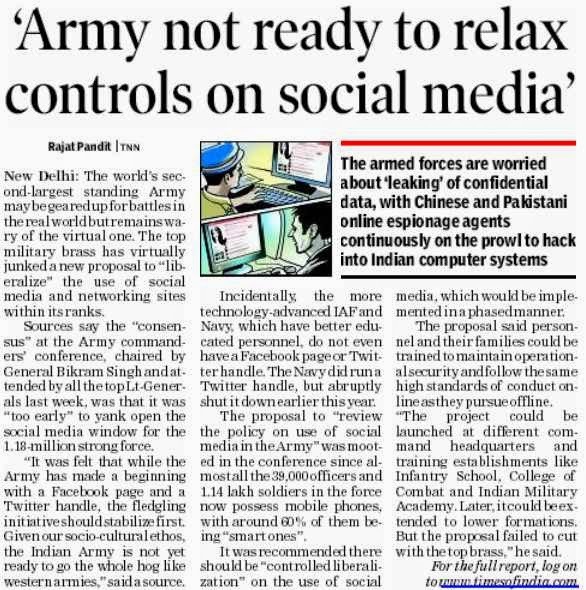 These lengths include the audacious report of an army troop movement near Delhi which “spooked” the government. After his retirement from the army, these very traits of General Singh were seen in the political sphere as he tried to make space for himself. First, he tried to make his space in the early parts of whatever it was that was brewing between Anna Hazare and Mamata Banerjee’s Trinamool Congress (TMC). 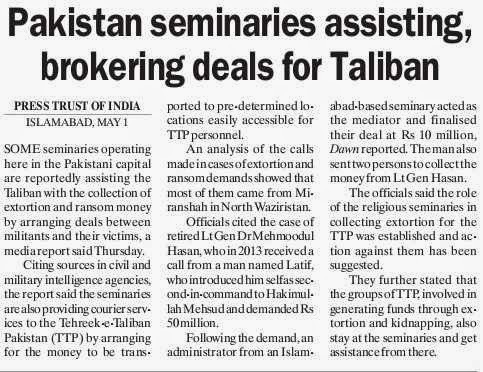 In fact, General Singh even approached experts for help in order to create a proper strategy route-map for what he was hoping was going to be a new political front. However, as the Hazare-Banerjee ship sank, Gen Singh managed to make his way into the BJP instead. For the BJP, inducting Gen Singh was not a tough decision in view of their ticket distribution policy, which is based on a ‘whichever candidate can win’ point of view. Plus, the General’s Rajput background was ideal for the Ghaziabad seat, which was vacated by another BJP veteran who is a Rajput, and whose name is also now cropping up for the post of India’s next defence minister. Though doubts remain whether Gen Singh will actually win in Ghaziabad, a seat where the BSP is also expected to make an impact this time, the hope that his army background will attract votes has been seen as a clever move. Irrespective of his troublesome background in the ranks, electorally in a place like Ghaziabad, all such matters that made news in New Delhi would not have had a big impact at the polling booths. However, opinions suggesting that Gen Singh will be awarded with a plush post if Narendra Modi was to become the prime minister, such as defence as some passing remarks suggest, are far-fetched and devoid of logic. The reasons behind this are many, including the institutional practices of the BJP as a party itself. Gen Singh is a new entrant into the party, and this will drop his chances of being picked up for any major assignment in a new BJP-led government ahead of the party’s career politicians. Second, Narendra Modi, in his defence and foreign affairs bend, will look to have a bold and scientific policy, which is traditionally expected of a BJP-led government. Gen Singh’s hawkish personality will not be seen as an ideal fit. Third, his skewed service record and the general unease that his name creates within the bureaucracy, specifically in the Ministry of Defence and the Indian Army, will work heavily against him. Lastly, culturally speaking, major posts in a BJP government are given to well-tested candidates who also have the blessings of the RSS. Gen Singh is technically perfectly cut out for a life in politics. However, the fact that he first showcased these traits in a sacrosanct institution such as the Indian Army has created big stumbling blocks for him for a successful and far-reaching political career, at least in the immediate future. The BJP will hope for his win in Ghaziabad and that is the region where Gen Singh will be contained in as far as party work is concerned, although his expertise will come in use for the government in areas such as parliamentary committees and so on. If Narendra Modi does become the next occupant of 7 Race Course Road, he will be coming into power bearing the weight of huge expectations on his shoulders. The margin of error for Modi will be next to nil, and to protect himself, he will build his decision-making circle with faces he trusts without question. People, in the opposing political parties, the public and certain colleagues of his within the BJP, will be waiting for one misstep to seize an opportunity for themselves, and Modi will be made to work hard to avoid giving away any such opportunities. Lt Gen C A Krishnan, a veteran infantry officer, today took over as the Deputy Chief of Army Staff succeeding Lt Gen Narendra Singh who retired after a 40-year career in the force. In the IAF, Air Marshal SBP Sinha took over as the Deputy Chief of the Air Staff and will look after modernisation of the force. Lt Gen Krishnan, 58, would be in-charge of procurements in the Army, which is undergoing massive modernisation. An alumnus of National Defence College, he has held a wide range of command and staff appointments during his 36 years of service. An expert in counter-insurgency warfare, Krishnan had earlier served in Operation Rakshak in Jammu and Kashmir, Operation Rhino in Assam and Operation Hifazat in Manipur. He also had a tenure in Operation Meghdoot on the Siachen Glacier and was Director General of Manpower and Planning in the Adjutant General's branch. Air Marshal Sinha, 58, is a fighter pilot who has over 3,700 hours of flying experience having flown the Hunter, MiG-21, Mirage 2000 and Su-30MKI fighter aircraft. He has held several important posts in the force and had headed the Airborne Warning and Control System (AWACS) Project Team in Israel.